Here we will tell you a bit more about the formal process of arranging a baptism or wedding at our church, or for arranging for the banns of marriage to be read at our church if you live in our parish but are getting married in another. Our clergy and Leadership Team are here to offer you help and support during these important times in your family life. To speak to someone face-to-face about a baptism, wedding or banns, then please come along to one of our monthly Vestry Hour sessions on the first Saturday morning of the month between 10.00-11.00am in our Welcome Area. There is no need to make an appointment, just turn up. Take a look at our Vestry Hour calendar for more information. If you cannot make one of these sessions or wish to speak to a specific member of clergy, then go to our Contact Us page to find out the best way to get in touch. 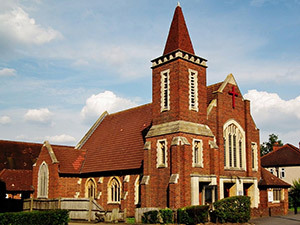 This church is the Parish Church for Worcester Park. You can see the boundaries of our parish by looking at our parish boundaries map. Baptism (sometimes called ‘christening’) is, above all, a sign of God’s love – a love which God has for each one of us from the moment we are born. In baptism, we thank God for the gift of life and the start of the journey of faith supported by the Church. We feel privileged to have the opportunity to welcome the newest member of God’s family. Baptisms take place within the normal 10am service on the third Sunday of each month. This is important as our congregation shares in the promises made and it allows us to all extend a warm welcome to the newly-baptized. We receive many requests for baptism during the year, so please apply early if you have a specific month in mind. There is no charge for baptisms. Finally, baptism isn’t only for children. If you are an adult thinking about Baptism and what it would mean for you, we would be very pleased to hear from you. We would be very happy to welcome couples who wish to be married at our church. Come along to one of our monthly Vestry Hour sessions (see above) to book a date with us and fill out the relevant forms. You should also contact us if you require your banns to be read out at our church – again the best way to do this is to come along to a Vestry Hour.